I found myself going back to Tras Street again for dinner. There are so many restaurants and so much going on in this area, even our Nose to Tail event later this month is held at a cooking studio along this street. Arriving early, I had a cocktail at the House of Dandy, a cocktail bar and lounge located a few doors away from Brasserie Gavroche, my restaurant of choice for a dinner with the family. The washed out teal coloured entrance to the restaurant certainly matched the old conservation shophouse where the restaurant is situated. Stepping inside, the décor from the floor to the lights on the ceiling screamed French. The ambience coupled with the prompt greeting at the door made me feel very much at home. As I studied the menu, I soon faced a huge dilemma. I didn’t know what to order as everything sounded so good. When the maître d’ came round to take our order, I hadn’t decided so I asked him what he recommended. He mentioned that the dishes with "Grandpa Henri" were sort of the signature dishes of the restaurant. There were two main courses with the name so my dad ordered one and I ordered the other. 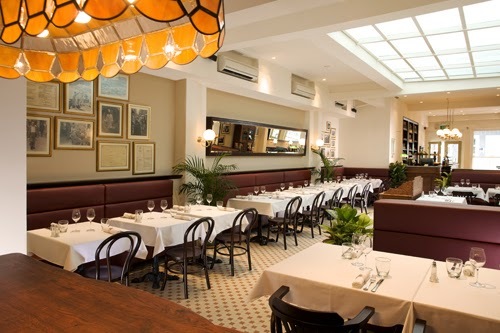 I learnt that Chef Frédéric Colin (owner & chef of Brasserie Gavroche) spent his formative years in cooking in his grandfather Henri’s restaurant and kitchen. These were some of the classic dishes cooked at his grandfather’s restaurant. For entrée, we had a pate that was on special that night. It was made with pork, veal, foie gras and had pistachio nuts inside. The veal meat and foie gras was fine textured with coarse pieces of pork fat and the slight crunch of the nuts. The result was a beautifully balanced pate, not overpowering but with the right amount of flavour to make me going back for more. There is also a grandpa Henri’s baked terrine with duck liver that I must go back for! Next we had Grandpa Henri’s onion soup served gratineed with bread and cheese on top. It was for my pregnant wife so I only took one spoonful of the soup which was tasty, again not overpowering like some places but refined and makes you want to continually eat it. I had the bamboo clams with artichoke. The clam was de-shelled and sliced up into bite size pieces along with the artichoke and tossed in a parsley and garlic sauce. I like the rubbery texture of razor clams and it went well with the artichoke though I wished the sauce had stronger herbs in it than just the parsley. For the mains, my dad had Grandpa Henri’s fish quenelle which was served with crayfish sauce and pieces of crayfish meat. Quenelle is a mixture of fish in a cream sauce put through a sieve and the yielding forcemeat is usually shaped into oval pieces and then poached. There is sometimes breadcrumbs and egg for binding used which explains the bread dumpling like texture. The quenelle soaked up the rich crayfish sauce and was a real treat to the tongue. My wife and mum shared the seafood vol-au-vent. Pieces of lobster and seafood in béchamel was put inside a hollow puff pastry. I only had a mouthful but this would certainly be the dish I would order the next time I come back. The lightness of the pastry combined with the savoury rich sauce and lobster meat was really delicious. I had Grandpa Henri’s pork hotpot with cabbage, carrot and potato. The tender pork ribs was in a pork broth which was perfectly seasoned. The vegetables were all cooked to the right texture and there was also a piece of French style sausage which was bursting with flavour. I can imagine this dish would be glorious on a cold winter’s night. We ended the dinner with a serving of profiteroles. The version here came with vanilla ice cream between the hollow plain pastry and topped with chocolate sauce. So simple but so yummy. Overall the food and service impressed me and I am left wondering why I did not come here earlier since it opened over 2 years ago.